As a fan, perhaps the greatest part of both professional and college sports is participating in the pregame traditions of your team. It&apos;s a time simply crackling with possibility, with excitement building to feverish levels as the game nears and the anticipation that you&apos;re about to watch your favorite team play becomes a reality. Even casual fans tend to take their pregame rituals quite seriously, often believing that what they say and do can have an influence on the outcome of the actual game. While we normally associate pregame traditions with the South (and Southern college football, especially), there&apos;s a whole other half of the country that has plenty of noteworthy rituals in its own right. They range from absurd to occasionally destructive, but in all cases, they encapsulate the passion and enthusiasm of the teams&apos; fans. Here, we&apos;ll take a look at some of the craziest, weirdest, and most spirited Pregame Rituals From the North. Before the game has even started—or indeed, before a ticket has even been sold—fans turn out to show their devotion in the most fascinating of ways. One pro-baseball team has even begun to sponsor a tailgate where fans can camp out in February for up to three days in anticipation of the release of season tickets. For the hearty souls bold (or crazy) enough to brave the extreme cold, there&apos;s plenty of food and entertainment to at least temporarily take fans&apos; minds off the fact that they&apos;re slowly freezing to death. On Northern college campuses, too, the weeklong campout is a time-honored tradition. Whether it&apos;s a clash against a rival or just a top team, fans are willing to brave the elements to make sure that they get a spot in the building no matter what. It&apos;s not unusual to see fans decked out in their team colors at a game, but between home and away jerseys on top of all the other colors available, what could be an intimidating home field advantage instead turns into a hodgepodge of different colors. 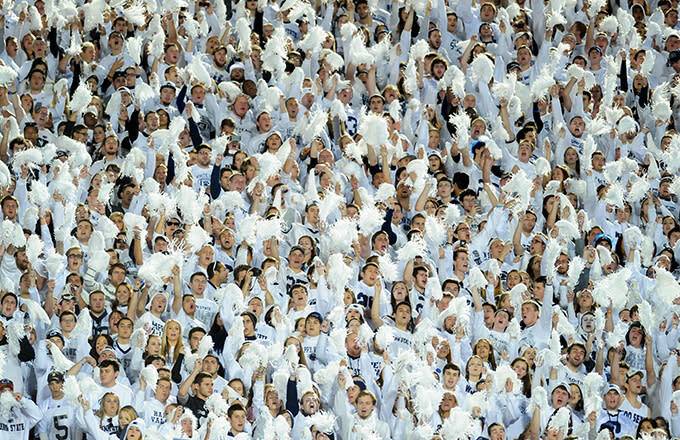 Sensing the need to intimidate all visitors that come to their 106,000-plus seat stadium, fans of a major college football team in Pennsylvania deem one game per year a "White Out," in which everybody in the stadium is required to wear white (and so does the home team). Playing against a major powerhouse is tough enough, but when you have to compete with another 100,000 people wearing the uniform? No thanks. And that&apos;s not the only way fans get involved in the action on the field. On the campus of another major college football program, the student managers themselves actually painted the teams&apos; helmets until 2010. While that task has now been delegated out to another company, the managers still are in charge of all aspects of maintaining the equipment and keeping this "hands on" tradition alive. But there are other traditions at that same school that are just as important to building a sense of camaraderie and spirit before the game, and this one takes the term "spirit" quite literally. 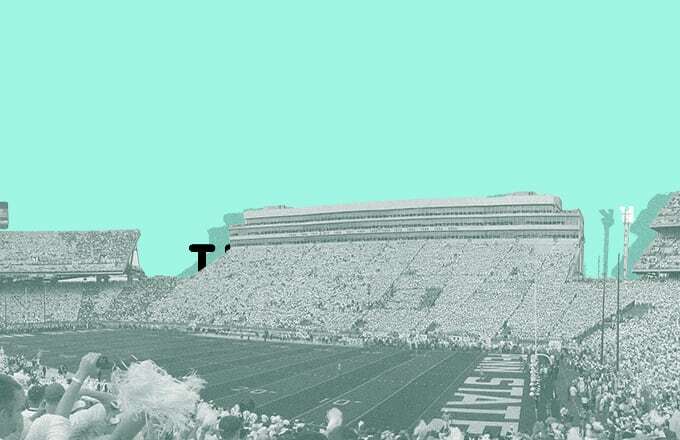 Fans from across the world travel en masse to walk underneath the massive campus mural known as "Touchdown Jesus," which adorns the southern panel of the campus library tower and overlooks the stadium. Part of a fan ritual is, after all, a plea for supernatural assistance in helping your favorite team win a game; this is about as direct an ask as a fan can make. Of course, once you get to the stadium there&apos;s a whole other aspect of ritual culture that many fans partake in. For fans in Northern Wisconsin, the tailgate has been taken to a whole new level with the conversion of houses adjacent to the stadium into tailgate palaces. Think, "man cave," but with multiple rooms, grills right inside, and a direct line of sight to the stadium where your favorite team plays. It&apos;s no wonder that these game day oases are some of the most in-demand properties in the entire city and play host to some of the rowdiest pregame festivities. If you don&apos;t have access to a house, of course, there are other options. Pittsburgh has developed a Mobile Tailgating Unit, which will quite literally bring the party to you. And this isn&apos;t just a grill strapped to the back of a car. We&apos;re talking about a full-service vehicle that is loaded with incredible food, a 20-inch flat screen television, and (remarkably) an onboard restroom. You can spot this converted ambulance at sporting events across the city any time of year, and for the right price, you can even rent it out for your own personal tailgate party. When the tailgate is winding down and fans in another Northern city are getting fired up for the game, one particular fan has become a local icon thanks to his pregame parking lot speeches that he uses to get the fans whipped up into a frenzy before heading inside the stadium. Of course, everyone has heard of a head coach giving his team a rousing speech to get them properly fired up, but a fan rallying other fans? That&apos;s a new one. With fan energy stirred up to a feverish level, sometimes they simply have to release that energy before the game starts. In Buffalo, N.Y., this has morphed into a peculiar tradition: breaking tables. After all, what better way to signify the end of your tailgate than by smashing your only apparatus for serving food? Whether months prior to the game even starting or mere moments before, both college and pro-sports fans have shown an extraordinary amount of imagination when it comes to crafting their pregame rituals. Regardless of whether you yourself have directly participated in them, there&apos;s no denying that these quirks add to the anticipation and excitement that surround sporting events, and indeed, many times they make the pregame experience just as fun as the game itself. This post is a sponsored collaboration between Jack Daniel&apos;s Tennessee Honey and Complex Media.